When it comes to your Christmas decorations, it seems like just about every neighbor or passerby has an opinion: too bright, too dull, too soon, or not Christmas-y enough. But while most these criticisms can be safely ignored as the mutterings of jealous, bare-homed individuals, there are some rules of taste that are best kept in mind when decorating your home for Christmas. The fact is, while it’s a joyous time, it’s a also a holiday built on precedent and tradition—not total anarchy. And, like leaving milk and cookies for Santa, timing your decorations right numbers among those those vital traditions. Obeying the tasteful dictates of tradition, however, is not the same as slavishly following the practices of those who came before you. 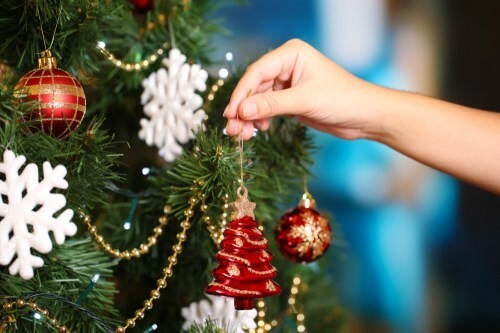 Hence you can safely ignore the “rather traditional” practice of saving your Christmas tree decorating until Christmas Eve, says Christina Hill, decoration coordinator at Hassle Free Christmas Tree. As Hill also notes, putting up decorations is “quite fun” and so there’s no need to prolong the wait until the last moment—unless you’re looking to practice self-abnegation in preparation for all those presents and holiday meals you’re about to indulge in. At the same time, you can also ignore the traditional belief to set up your tree and decorations “at the beginning of Advent,” says Hill. As per the classic chocolate-filled calendars of the same name, this is a period which includes the four Sundays before Christmas—giving you twenty-eight days of visible holiday cheer prior to the big day. While this might be a suitable amount of festivity for some, there’s no reason to restrict your decorating time to a Sunday, when most people—dreading what the next day brings—just want to relax. But before deciding to hang your wreath on the second Saturday in July, it’s important to note than you can also havetoo much time to bask in your holiday cheer. Like a fine wine, decorations simply don’t age as well once they’ve been taken out of the cellar. Knowing the proper date to decorate, however, doesn’t mean you’re out of the woods just yet. The fact is, social pressures are stacked against you. As Hill explains, “every year, Christmas markets open sooner than the previous one,” in hopes of increasing revenue. To make sure you stick to your original plan, then, you’ll have to follow Oates’ call to “band together and rebel against big box retailers telling [you to] start Christmas…in September.” Just remember that whenever you feel like giving in—say, putting out a nutcracker in late October—appropriate holiday decorations are a necessity for proper holiday digestion, green bean casserole included.